By buying this product you'll earn up to 180 Rewards points. Written by Crutchfield's Tara W.
Niles Audio's TVC-1 is a great addition to any multi-room system. This table-top stereo volume control works with a single pair of speakers  use one in each listening area for volume controls at your fingertips. It lets you adjust the volume for each space so you don't end up with music that's too loud in the kitchen but barely audible in the living room. Overview: The Niles TVC-1 is a tabletop volume control for home loudspeakers. It connects between the speaker-level output of your amplifier or speaker selector box and your pair of loudspeakers. A perfect application for the TVC-1 is adjusting the volume of remotely located speakers. The Niles TVC-1 enables full-range volume adjustment of remotely located speakers. All Metal Chassis: The Niles TVC-1 tabletop volume control features an all metal chassis construction. AutoFormers: The Niles tabletop volume control uses autoformers instead of L-pads for the volume controlling element. This assures minimal internal power dissipation with virtually no power wasted as heat. Separate Ground Paths: The Niles TVC-1 tabletop volume control utilizes separate left and right round paths for compatibility with all amplifiers. Power Handling: The Niles TVC-1 tabletop volume control can handle up to 100-watts RMS per channel (200-watts Peak). The TVC-1 is designed for use with a receiver or amplifier having a maximum power output of 100 watts per channel at 8-ohms. Note: Damage caused by the use of a high-power receiver or amplifier will void the warranty. Flat Frequency Response: The TVC-1 has an absolutely flat frequency response from 20Hz to 20,000Hz which ensures clean, distoriton-free listening. 12-Step Volume Control: The TVC-1 adjust the volume of your connected speakers by attenuating the amplifier signal. The unit features a 12-step volume control with 54dB maximum attenuation. 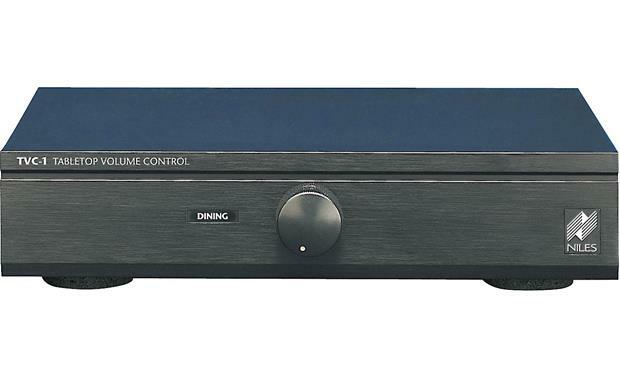 Note: The volume control of your receiver or amplifier serves as the "master" volume for all speaker pairs connected. Selectable Impedance Magnification: The Niles TVC-1 features selectable impedance magnification for 1, 2, 3/4, 5/6 pairs of speakers. 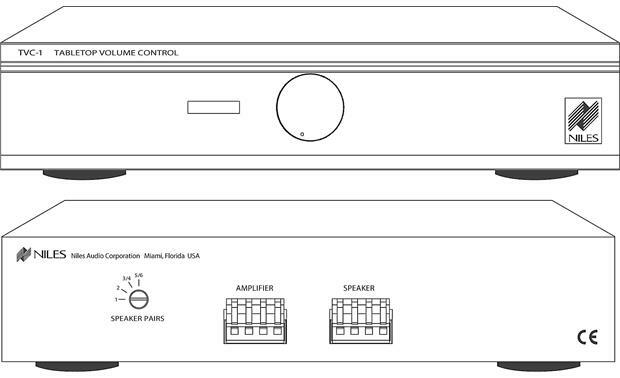 Note: Every speaker pair in the system must be connected to an impedance-magnifying volume control and set to the same magnification. Removal Speaker Connectors: The Niles tabletop volume control features removable screw-less speaker connectors that accommodate 22 to 16-gauge speaker wire. 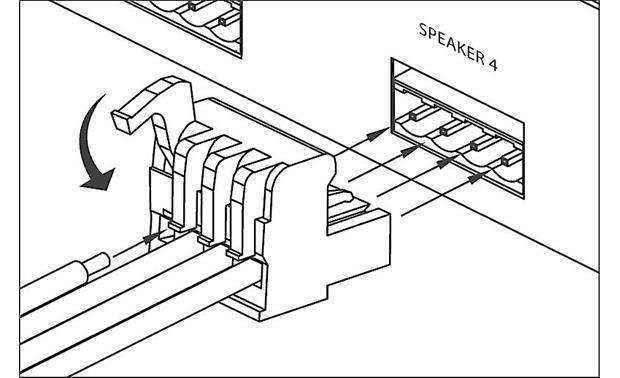 The TV-C1 is equipped with one set of input speaker terminals for connecting your amplifier or speaker selector box, and one set of output speaker terminals for connecting a pair of loudspeakers. Note: For most applications, Niles recommends 16 or 18-gauge speaker wire. For wiring runs longer than 80-feet, 16-gauge wire is recommended. Using speaker wire larger than 16-gauge is not recommended, as it may not fit into the connector. Always use stranded copper speaker wire. Never use solid-core, aluminum or "Romex" type wire. Non-skid Feet: The Niles TVC-1 uses four non-skid feet to ensure stability during operation and prevent scratching your furniture. Identification Labels: The Niles TVC-1 tabletop volume control includes 72 adhesive-backed room identification labels. Searches related to the Niles TVC-1 Table-top stereo volume control.